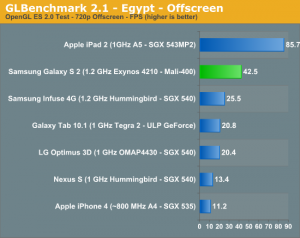 SGX 543MP2 vs Mali-400: Is iPhone 4S GPU Really Twice As Strong As SGS 2? Ever since Apple announced the iPhone 4S having “A5″ processor, everyone has been pointing to the below image from a test run by Anandtech and saying that the iPhone 4S will be twice as strong as the Samsung Galaxy S2. I beg to differ. 3. It is naive to think that the same SGX543MP2 implementation as iPad 2 will be present in iPhone 4S. Even if iPhone 4S is slated to have “A5″, a lot depends on the actual clock speeds (CPU and GPU), graphics memory, etc. Apple will do similar trade offs like Samsung (and Apple has already done this with A4 in iPad 1 vs iPhone 4) and the real results would be available only then. So, the end result is that we will have the real comparison only when iPhone 4S is out. PS: Not that the results matter anyways since firstly, the comparisons should now be moving to upcoming Nexus Prime and not SGS2 and secondly, the raw power of these GPUs won’t determine much since they cater to two completely different OSs and would have a lot of software and ecosystem dependencies on the user-perceived outcome.